July 11-15 | Diving into Atlantis - CAMP FULL! Our camps are structured around children exploring their creativity in a fun, relaxed and collaborative environment and to be supported and encouraged to find their inner actor, director, writer, prop master, costume designer, etc. The bulk of the creative product will come from the camper's own imagination as they make decisions on everything from dialogue and set design, to costumes and props, posters and more. This is truly a children's theater production and the result is quite engaging and special. Campers will perform their full stage production for family and friends at the end of each week. Arts in Motion Theater Company provides a safe and welcoming environment for children to learn, be creative and collaborate with others. 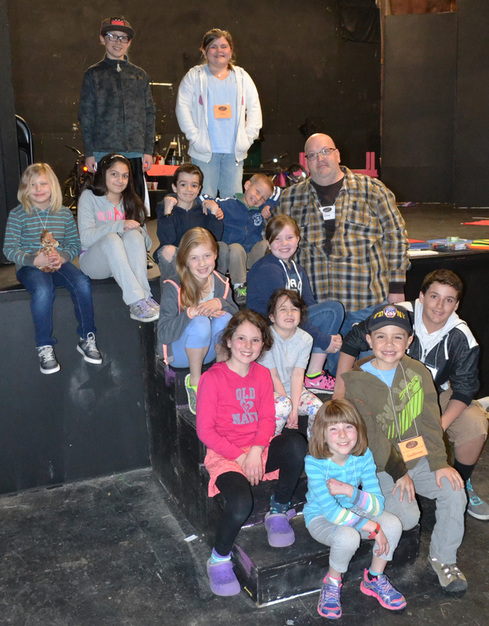 Lessons learned in theater camp are beneficial to children in so many other ways. Once they step off stage their new found skills go with them. REGISTER TODAY! It's easy! Print the registration form and mail with your payment or click here to pay by cc online. Scholarship aid is available. Just print, complete and return. The campers of the Spring 2015 Vacation Week Theater Camp had a fantastic week and performed their show "THE FREEZING, SHRINKING SPRING". The campers played a huge creative role in their production and did a wonderful job! See below for photo gallery! Zack has enjoyed performing on stage since the age of 8 years old. Throughout the years he has starred in over 30 Arts in Motion and Kennett Drama Club shows, and you may also recognize him from the KHS Drumline, Select Choir, Stage Band, or Glee Club. After high school, Zack continued performing in college with Dramatis Personae, a student run theatre club at University of Hartford. During his 3 years he studied many engineering fields, from audio to mechanical to prosthetics and civil engineering. This Fall, he is excited to study environmental engineering at Humboldt State University in northern California. Most of all, Zack is ecstatic to have the amazing opportunity of directing this year’s Children Theater Camp after interning as a counselor 3 years ago! He would also like to thank his awesome Mom, Sadie Kelley for her love, support, and push to get on stage in the first place. Hailee Tilton is a senior at Kennett High School and had been involved in theater since she was 8 years old. She has been apart of Arts in Motion Theater Company for 4 years now and has enjoyed and loved every second of it. This will be her second year as a camp counselor for the theater camp, and can't wait to have another amazing summer. Her hobbies include singing, reading and spending time with family and friends.